Looks Good from the Back: Adrien: That HG Item. It's now my favorite t-shirt. It's really, really thin and I have to be careful because I think it's made from tissue paper, but man, I love this shirt. 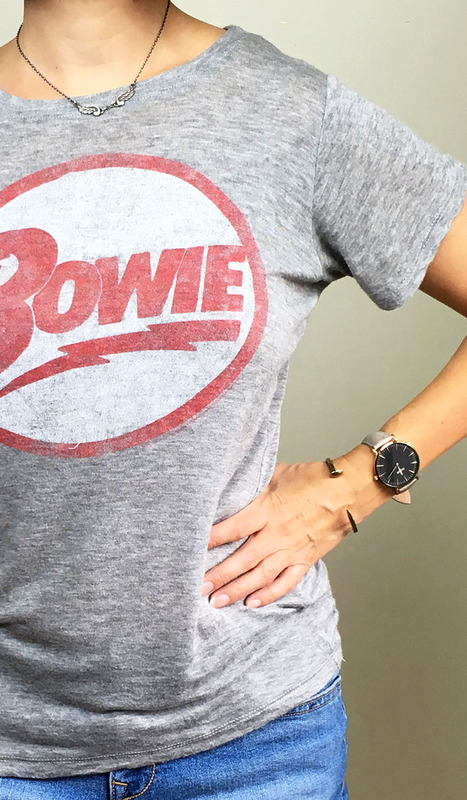 The brand is Daydreamer and they make all kinds of cool drapey graphic tees. I personally love this Ramones tee and, heh, I wouldn't mind having this Nope tee either. They also do a decent T. Rex. I approve. My awesome little silver wings necklace was made by my friend Tere of My Precious Studio. Highly recommend. I'm also wearing my Cluse La Bohème watch and a Giles and Brother skinny railroad spike bracelet. The fancier encrusted version is on sale! 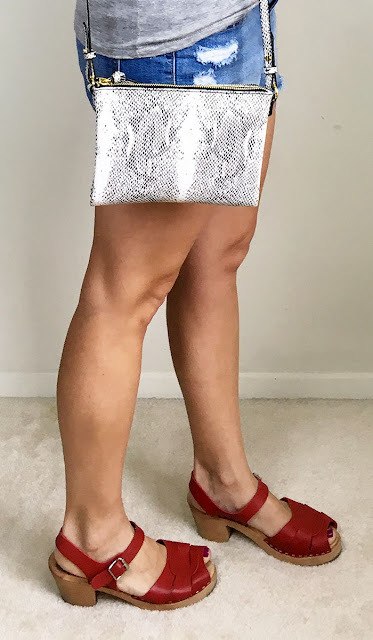 This little snakeskin crossbody bag from Old Navy has been great this summer. It's inexpensive, lightweight and cute as hell. If snakeskin isn't for you it also comes in a few neutral colors and in silver! Damn, the silver version is really cute. 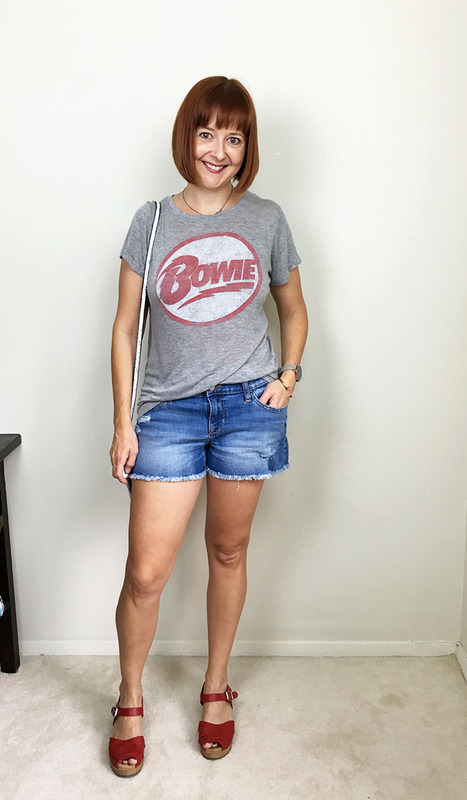 My shoes are Lotta From Stockholm peep toes and I love the having a little red to echo the Bowie graphic on my t-shirt. These shoes also come in silver in case you were wondering. Aren't I helpful? So tell me, what's your Holy Grail item? What have you been searching for forever and not finding? I've been enjoying your blog now for a few months and know your love of David Bowie. 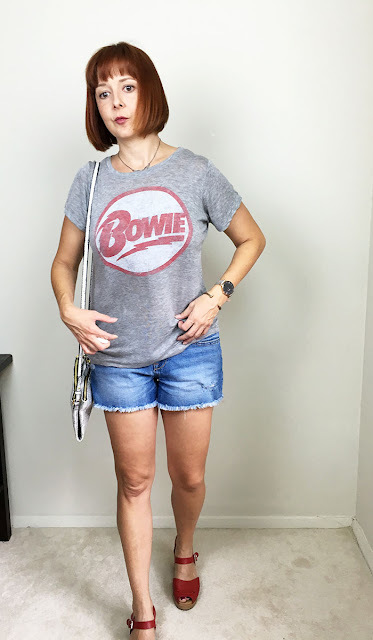 I just wanted to pop in and say that I saw a similar blue Bowie t-shirt but longer length on the JCPenney website for less than $15. It is in the juniors top section so am not sure of the fit but I thought I'd point it out to you.